Love needs no reason to be celebrated. But Special Days and occasions give us an opportunity to enjoy and spend time together and create memories that last a life time. Pacific Mall, one of India’s toppremium shopping, entertainment and leisure destinationshas re-invented the wheel and taken Valentine’s day celebrations to the next level making it a fun day for kids, teenagers and adults with a host of activities and performances lined up for the entire day. 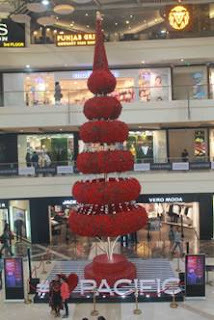 The mall centre of attraction is a special “Tree of love”. The 45feet high specially designed to get that perfect selfie with your loved ones! is made out of artificial red roses. Also, all those who shops for over Rs. 3000/- and drops their name under the tree of love, would get an opportunity to win a surprise gifts daily. Apart from the décor the Mall has made arrangements for a breathtaking Tap dance performance on 14th Feb and it also has an array of special dinning and shopping offers.